Free Video to Audio Converter is a powerful audio extractor extracting audio from video, like convert MPEG to MP3, convert MPEG to M4A, and AVI to MP3. The primary function of the video to audio converter is extracting audio from video files, such as convert AVI to MP3, and convert MPEG, WMV, MP4, MOV and RM to MP3 file. Moreover, Free Video to Audio Converter can convert among various audio formats as an audio converter. Compared with other audio extractors, Free Video to Audio Converter supports so comprehensive video and audio formats like AVI, MPEG, GIF, Flash, MP4, WMV, MP3, WMA, WAV, M4A, AAC, and OGG, as well as APE/CUE decoding and audio CD ripping with lots of codecs. With various settings and high conversion speed, Free Video to Audio Converter is Completely Free! Input: AVI, 3GP, GIF, MPEG, WMV, MP4, DV, MOV, M4V, VOB (the video format used in DVD), SWF, NUT, RM, APE, CUE, 3G2, MP2, MP3, RA, WMA, WAV, M4A, AAC, OGG and CDA. Output: WMV, MP2, MP3, WMA, WAV, M4A, AAC, AC3, OGG and AU. 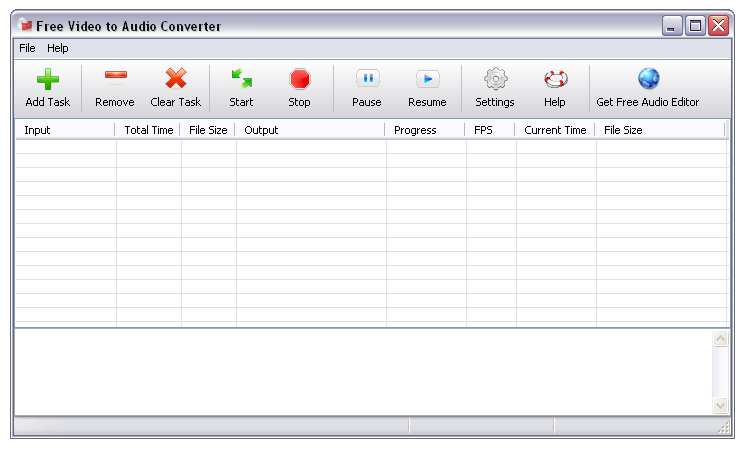 Switch is a free sound file converter for Windows. It can convert mp3, wav or wma format and more to the audio format of your choice. Leawo AVCHD Converter is a powerful AVCHD video converter that can convert AVCHD videos to all popular video and audio formats with excellent quality, such as avchd to avi, mts/m2ts to mp4, mod/tod to flv, mkv to wmv, etc. Edit your audio collection, record audio data. Remove background noises. Apply effects. Edit your tracks in MP3, M4A, WAV, WMA, OGG, FLAC, SHN, APE, VOC, MIDI, etc. Create a unique ringtone for iPhone. Leawo Prof. Media can convert video and audio files, rip Blu-ray and DVD, burn video to Blu-ray/DVD, backup Blu-ray/DVD movies, and download online videos.